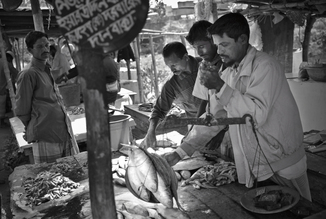 Marketeers weigh fish for a customer at the market in Kuakata. With the shrinking populations, larger fish such as these Hilsha on the scales become rare and expensive. Kuakata, Bangladesh, Feb. 13, 2008.